The Fantastic Cave Landscape with Odysseus & Calypso was painted by Jan Brueghel The Elder with Hendrick de Clerck. It looks the other way about, but its theme is the seduction of Odysseus by Calypso. Boccaccio, writing in the mid-fourteenth century, uses a grotto in one of his tales: …. “he let himself down thereby into the grotto and there awaited the lady, who, on the morrow, feigning a desire to sleep, dismissed her women and shut herself up alone in her chamber; then, opening the privy door, she descended into the grotto, where she found Guiscardo. 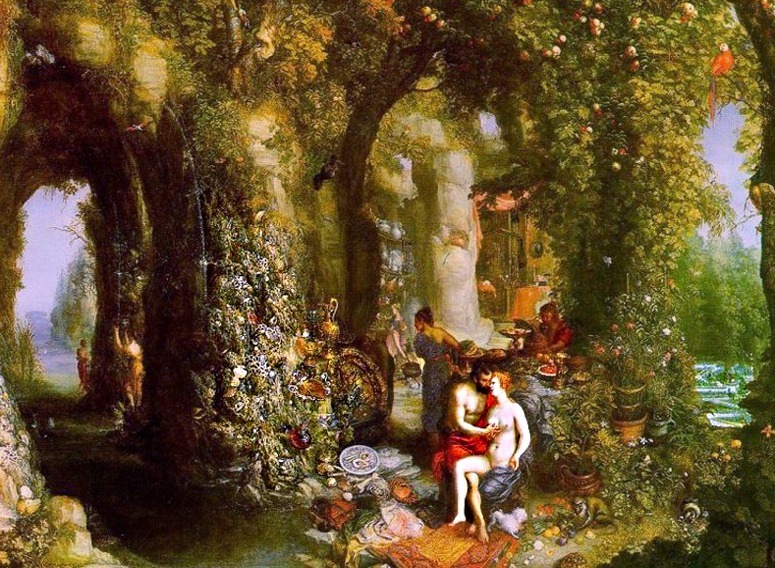 They greeted one another with marvellous joy and betook themselves to her chamber, where they abode great part of the day in the utmost delight; and after they had taken order together for the discreet conduct of their loves, so they might abide secret, Guiscardo returned to the grotto, whilst she shut the privy door and went forth to her women. The night come, Guiscardo climbed up by his rope to the mouth of the tunnel and issuing forth whence he had entered in, returned to his lodging; and having learned this road, he in process of time returned many times thereafter”. In history, garden grottoes are associated with the Earth Mother, Gaia, who was also manifest in the house, the courtyard and the womb. James Lovelock’s Gaia hypothesis, holds that the Earth (atmosphere, cryosphere, hydrosphere and lithosphere) form a single complex interacting system – an organism. Garden designers can help save the planet by building grottoes which remind everyone to love and respect our fructiferous Earth. Grottoes also give gardens conceptual and perceptual depth, defining their status as a thin biotic layer between the heat of the sun, the thin wet layer, and the heat of the magma. I am confident that a grotto could win a Best Garden Design in Show Award at the Chelsea Flower Show. So “Bring Back the Grotto”. This entry was posted in Garden Design, Sustainable design on 30th August 2010 by Tom Turner. Does Leeds Castle have the lovliest castle garden in England? Leeds Castle gets enormous and well-deserved publicity as ‘the lovliest castle in England’ and is crowded with visitors paying £17.50 each in 2010. My guide book says the garden is Grade II listed. If correct, this is ridiculous. The designed landscape around the castle should be Grade I+++ listed. The riverside garden and the Culpepper Garden (supposedly designed by Russell Page) are mediocre. But why? With such a host of visitors the Leeds Castle Foundation must have a sufficiency of funds. I would not criticise the design if it were a public park in run-down town in a depressed part of the English Midlands. But for the surroundings of the very finest example of a designed medieval landscape in England – I recommend the appointment of a skilled designer-manager. England has few better places in which to dream of gallant kings, beautiful maidens and the age of chivalry. At the time of their marriage, in 1524, Edward was 15. Eleanor was 10 years old, Spanish and beautiful. It was an exceedingly happy marriage, arranged by their parents. They had 16 children. Edward was a great military leader and in 1271 he and Eleanor were in Acre, crusading. Her child miscarried and they returned home via Rome, where they met the Pope, and via Paris. We would frown on the early marriage and the anti-Muslim crusade. 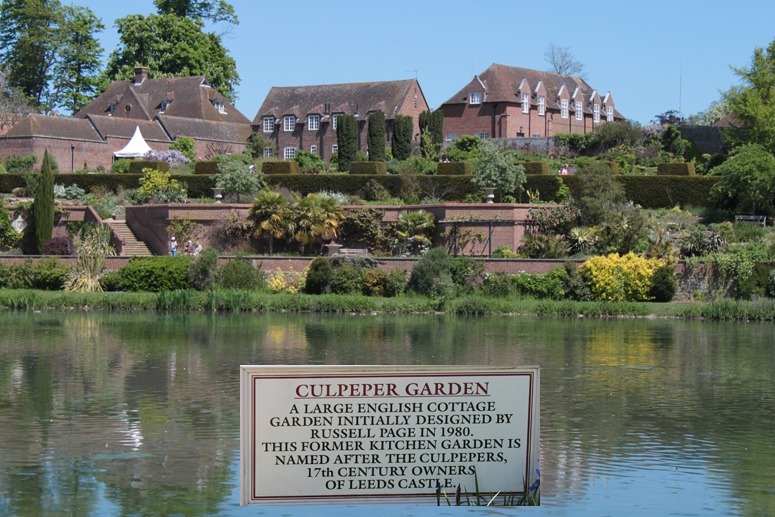 One can rarely judge an earlier age by the standards of a later age – but we need have no reservations in criticising the current design of Leeds Castle Gardens. It’s pathetic. And why did they litter the streambank with old railway sleepers? Maze, 1988, by Vernon Gibberd. Who will win the fair maid? The maze at Leeds Castle is of a different quality: it is well conceived, well made, well positioned and popular. Unicursal (one-path) labyrinths were popular religious symbols in the middle ages and symbolized the spiritual path a pilgrim might take. Multicursal (many-path) mazes were popular renaissance games. 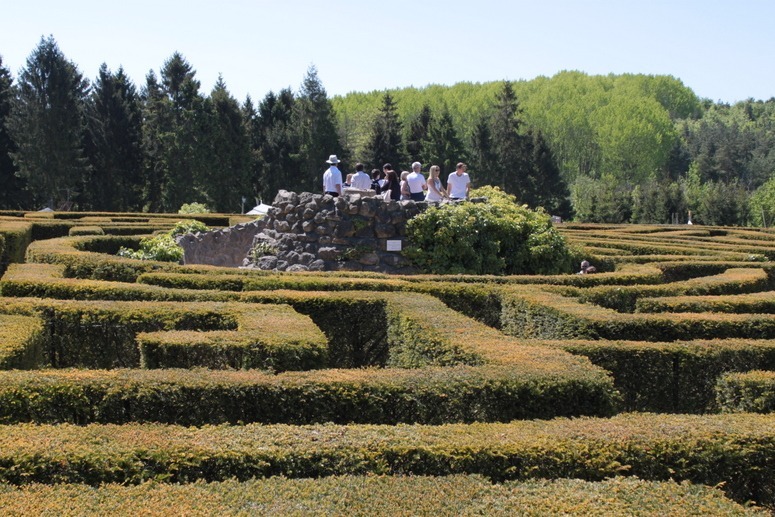 They were fun to experience and symbolic of the difficulties of finding and winning the game of love: a fair maid might be placed at the centre of a maze. The Leeds Castle Maze is enjoyed in precisely this way and does not conflict with the medieval castle landscape. This entry was posted in Garden Design, Garden Visiting, Historic garden restoration on 26th August 2010 by Tom Turner. 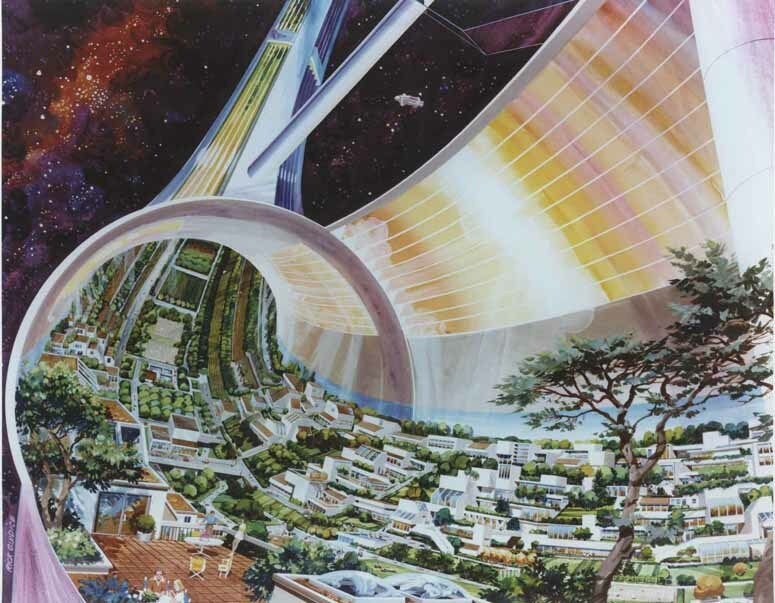 Thank you to Jack Varga (on Larch-L) for drawing attention to Nasa’s ideas on space colonies (see explanation and examples). They remind me of Sarah Eberle’s built example at the 2007 Chelsea Flower Show. But the Nasa examples are oddly suburban, as if humans would invest in travelling the universe to enjoy the delights of a modernist Levittown at high densities. Why would they need roofs if living in tubes? To protect from artificial rain? But it is probably correct that humans would soon tire of inter-galactic marvels and gaze instead at what the neighbours are up to – and that interest would help sustain tube life. It might in fact be a better idea to dispatch a spatter of tiny rockets containing only DNA, and this might be how life came to Planet Earth 3.5 billion years ago. My plea to Nasa is to send un-manned observatories into deep space – not humans. This entry was posted in Sustainable design on 21st August 2010 by Tom Turner. Romantic new cafe garden and elegant architecture in London’s Chiswick Park? 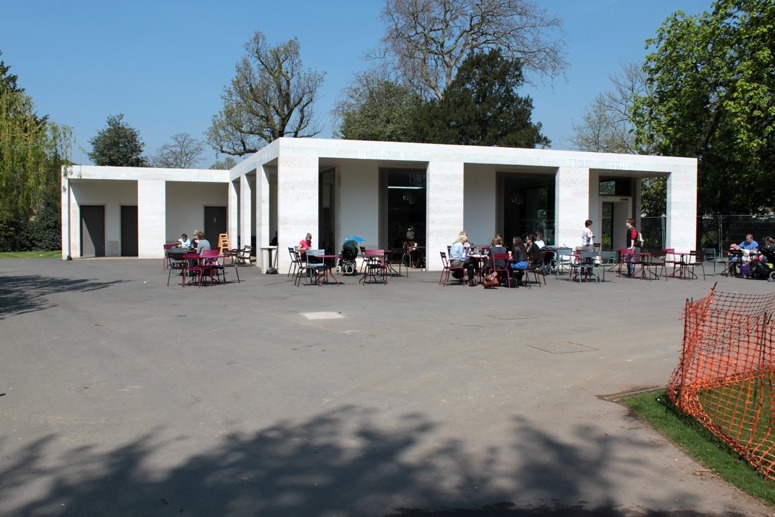 Chiswick Park gets a romantic new garden cafe! This entry was posted in context-sensitive design, garden history, Historic garden restoration on 19th August 2010 by Tom Turner. Has London gotta lotta bottle? – or too many garks? 1)Transparent Container, usually for liquids that is narrow, circular-based, mostly handle-less and with an ever-narrowing top, where the opening is found. 2) To hit someone on the head with a glass bottle, smashing the bottle in the process. So ‘Yes’ for its urban space. But ‘No’ for its many garks. 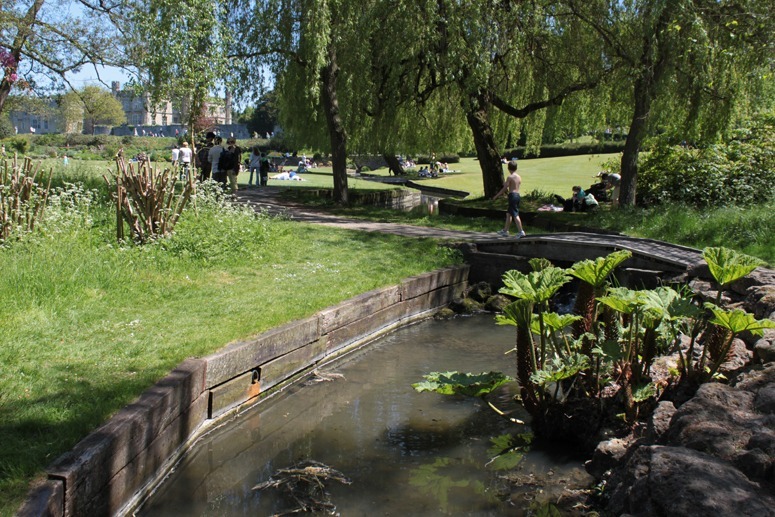 This entry was posted in landscape planning, London urban design, Public parks on 15th August 2010 by Tom Turner. Postmodern landscape architecture by Peter Walker and Partners? Sometimes, I wonder if landscape architects have borrowed my diagram of the postmodern style and scanned it into their computers. But since this design for a reflecting pool and fountains at Children’s Park and Pond in San Diego, California (by Peter Walker) won an an ALSA award in 1998 it would be better to ask me if I used it when drawing my style diagram – in 1999. The answer would be ‘No’ and I would classify the design as ‘geometrical postmodernism’ rather than ‘ecological postmodernism’ or ‘functional postmodernism’. The Peter Walker website puts it like this: ‘ An outdoor space for the Children’s Museum, this project transforms the traditional elements of a park — turf, flowers, benches, shade, and water — into whimsical abstractions. The vast horizontal expanse of a two hundred-foot wide pond is reinforced by a circle of tall Mexican fan palms. A fountain animates the pool with a grid of Rainbird sprinkler heads. 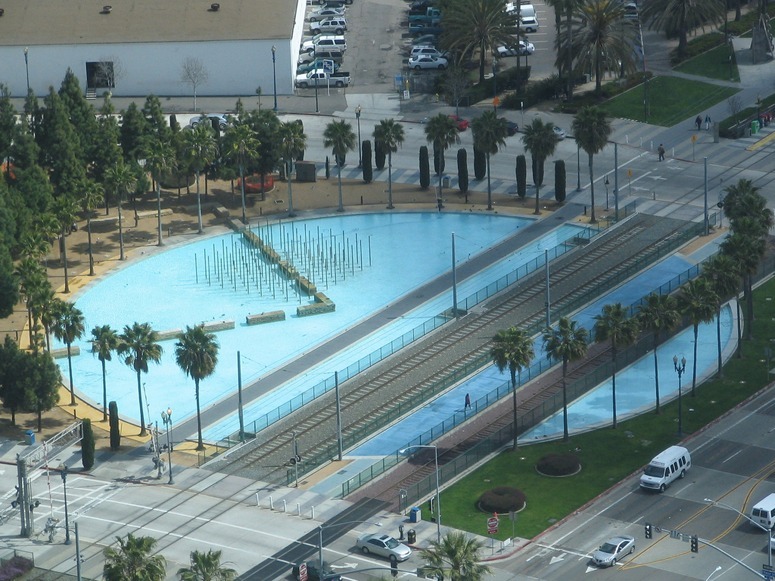 The monumental pond also articulates the intersection of the park and the linear Martin Luther King Jr. Promenade, as it is literally traversed by the tracks of both light rail system and train.’ – and the key word is ‘whimsical’. Picadilly Gardens in Manchester, by EDAW, also resembles my diagram but the design was done in 1998. This entry was posted in Landscape Architecture on 12th August 2010 by Tom Turner. When John Harvey became President of the Garden History Society, in 1984, the great medieval historian suggested bringing back the grape vine as an ornamental plant. He explained that: ‘From very early times until the eighteenth century the vine was one of our chief garden plants, quite apart from attempts to make wine in England or to obtain dessert grapes – though both these enterprises had considerable success. As a climber, against walls or used to cover arbours and tunnels, the vine is outstandingly beautiful and, in several varieties, completely hardy in most of Britain. This is brought home to us when we realize that one of the largest and oldest vines ever grown was in the open air in the High Street of Northallerton, surely one of the coldest and draughtiest towns in England. The grape-vine was, and could be again, one of the greatest beauties of our gardens.’ (Journal of the Garden History Society, Spring 1984, p.5). The seemingly ever-warmer summers with which Global Warming threatens to bless England reinforces Harvey’s suggestion: Bring Back The Grape Vine. 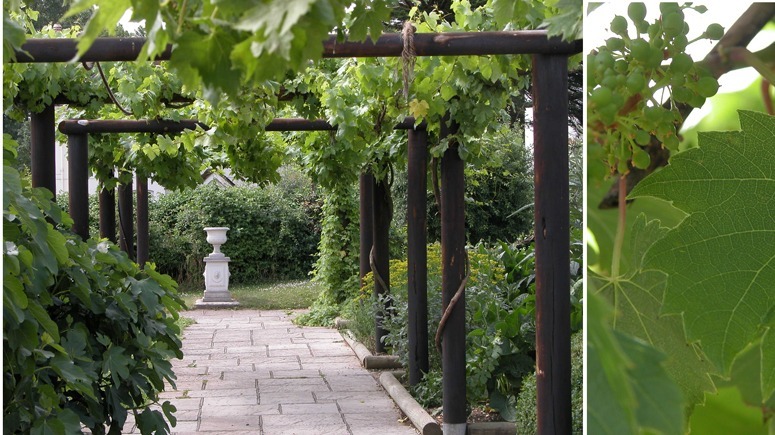 The vine was probably introduced to England by the Romans and the image (courtesy Gauis Caecilius) is of a vine pergola at Fisbourne Roman Palace. This entry was posted in Garden Design on 8th August 2010 by Tom Turner. 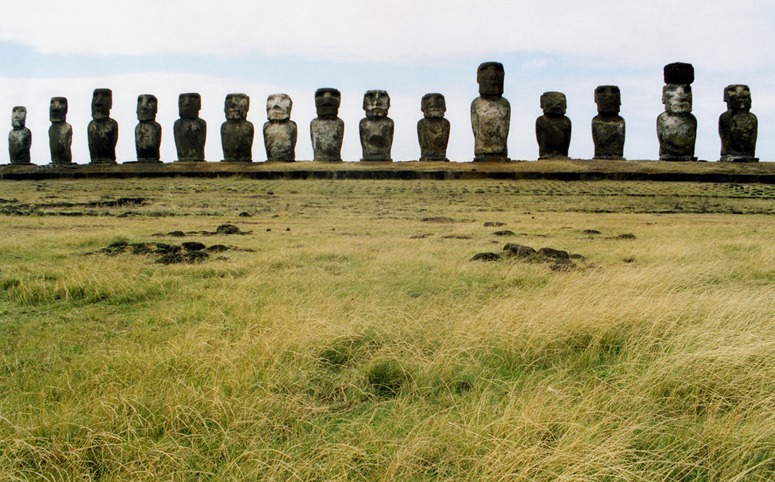 Following the below comments on Attitudes to life, death and trees in western culture and ‘civilization’, I thank Anoldent, for his photograph and his account of the Fifteen Moai on Easter Island: ‘Moai were status symbols. The more you had and the bigger they were, the greater your village’s status. Unfortunately, moving them around the island required many trees, and when the last trees were cut on the once heavily forested island, the topsoil blew away, the islanders could no longer build fishing boats, or even escape the ensuing famine. Wars erupted and the culture collapsed. An environmental cautionary tale. The island is still largely treeless.’ On a larger scale, too many humans think this way: ‘the more you have the better you are’: more rooms, more people, more buildings, more cars, more economic growth. But for humans who inhabit an island or a planet, aiming for more may result in less. Let’s call it ‘the Easter Island Path to Perdition’, and let’s be sufficiently optimistic to believe that the ‘civilization’ of cities will be replaced by a sophisticated landscape urbanism. 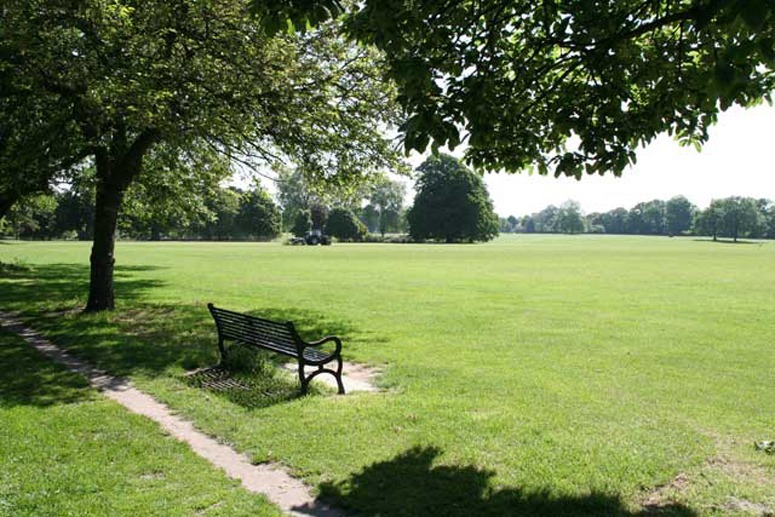 This entry was posted in landscape planning, Sustainable design on 3rd August 2010 by Tom Turner.